Genesis Sylvester and Tweety in Cagey Capers in 05:16.22 by maTO. 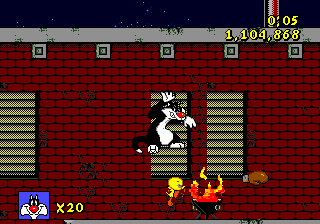 Sylvester and Tweety in Cagey Capers was the first game to star the iconic Looney Tunes duo. As Sylvester, your goal is to catch Tweety as he moves across the level away from you. The game has a difficulty slider adjusting how hard the canary is to catch. Of course, this TAS slides it all the way up. This run utilizes tricks to move Tweety forward in the level, including scaring and swiping at him, until he can be caught at the end. The author, maTO, catches the bird in all levels in a little over 5 minutes. For a run of a game with a similar mechanic, see Tom and Jerry: The Movie.